White Feathers were handed out in Britain during wartime by women to men still at home as a symbol of cowardice. 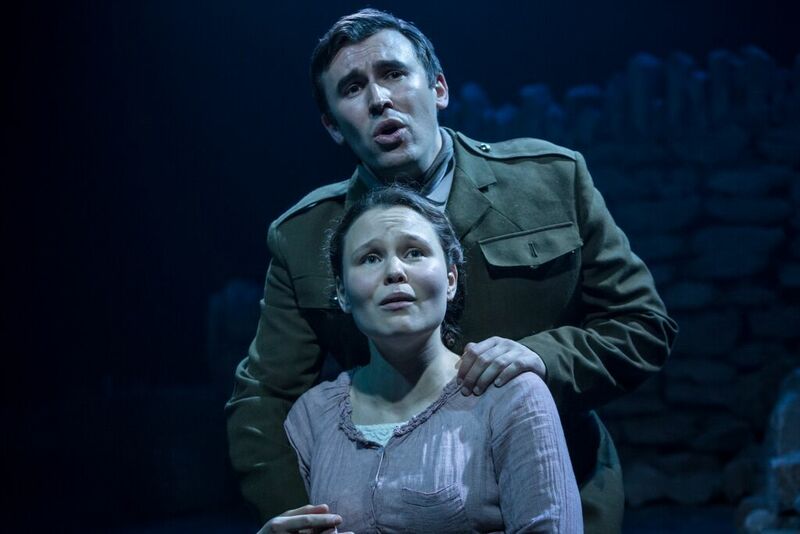 Arion Production’s The White Feather attempts to explore the theme of bravery and cowardice through the eyes of one village’s experience of war, and the journey of an underage soldier and his sister… as well as several other subplots. The show sadly doesn’t seem to have worked out what its main storyline is, so the entire piece of relatively short scenes, feels haphazardly thrown together. The piece takes place in a rural Suffolk village, set charmingly by the company’s technical collaborators; sound designer James Nicholson’s use of birdsong underscoring the audience’s entrance at the beginning of the two acts complimented beautifully by Neil Brinkworth’s soft lighting, and a picturesque set design by Tim McQuillen-Wright. The production values are predominantly very good, the company makes intelligent use of what could be a compromising space at The Union Theatre, but seems to suit this show very well. The underground venue in particular heightening the trench scenes; distant train noises overhead feeling like the sounds of nearby crossfire. A promising touch on the suffrage movement is executed with a song which sadly felt a little lack-lustre, through no fault of the commitment of the ensembles, nor their lovely, well-sung harmonies. The majority of the songs are sung beautifully, with thanks to Dustin Conrad’s musical direction, although at times they could have been more balanced; a slightly shrieky soprano line was useful in the final song of Act one, powerfully reminding me of Jason Robert-Brown’s Parade, but otherwise felt overbearing. The boundaries generally feel safe within the song writing of The White Feather, and are at times predictable, not helped by the delivery of songs sometimes lacking in believability. Musicals are often at their best when the songs flow seamlessly from speech, and come because there is no other way to communicate what is being said through the numbers than to sing; however, like the several sub plots feeling shoe-horned into this Musical, the same can be said for a proportion of the songs. The songs are underscored by an undoubtedly talented three piece band, who’s instrumental accompaniment of Set Them in Stone, is hauntingly beautiful. This song is a moving and memorable highlight of the whole show which will stay with you long after leaving. Foggy forwards lurches in time do not help with the already muddled through-line of the show. Holes in the plotline of the first half are hurriedly ‘resolved’ in the latter half, leaving the audience uneasy at the sudden changes, notably in the ‘warm feelings’ between the characters of Adam Davey and Georgina Briggs which seemed to come out of nowhere. This is closely followed by a reveal of a secret homosexual relationship, which offered a platform for this production to be bold, brave, and could have given some much needed vulnerability and like-ability to the otherwise slightly one-dimensional villainous character of Davey. But sadly falls a little short, there is slim to no chemistry between the two males playing these lovers, and we are left watching their duet feeling unintentionally more awkward for the actors, as opposed to their characters. This production as a whole is perfectly nice, though I was not swept away nor feeling overly emotional connected to any of it, unfortunately it doesn’t ever really reach its full potential. It is a piece craving far more clarity from both direction and writing, and I hope for the hard-working ensemble’s sake, it eventually receives both.